Atec has an aerospace quality fabrication department that is certified to all necessary AWS specifications as well as MIL-SPEC requirements. Our fabricated products range in size from small, intricate pieces to large weldments and fabricated structures. From Jet Engine Test Cell Thrust Frames to Very Large Scale Intake & Exhausts to Energy Service Skids to Modular Test Cells & Cabs we produce large close tolerance fabrication. We utilize our specialized and standard types of welding machines and equipment necessary to perform the welding of test fixtures needed for your project. New heavy Pull Test foundations and frames have been added at all locations. Atec now offers heavy power and explosion testing. Celtech and Vital Link offer large outdoor forklifts, covered storage and large lay down areas to our heavy fab capabilities. We offer complete material origin tracking to assure all products are fabricated with proper base alloys and welding materials. Atec has a supplier qualification and rating system, and alliances with proven suppliers offering significant extensions of our fabrication capabilities, under the supervision of our inspectors. 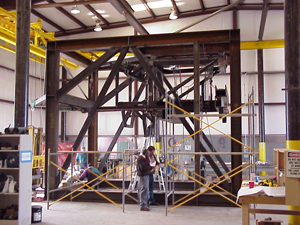 Celtech’s large scale fabrication assets have increased our production capacities and our field services. 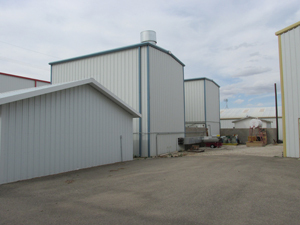 Vital Link’s famous fabrication plant now adds 30 acres, 100,000 square feet and 100 personnel to our large scale manufacturing. 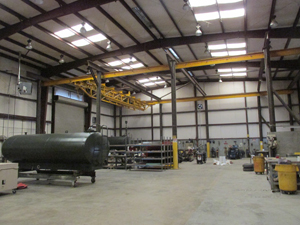 Hager provides large scale turning and multi-axis waterjet capabilities and laydown/yard storage resources. Atec has extensive experience in engineering, design and qualification of equipment worldwide. As an industry leader, Atec has been delivering ruggedized custom support equipment for over 60 years. Atec’s project engineering group can deliver all aspects of the project: from the conceptual stage through qualification testing and production manufacturing. In addition, Atec adds value to the project through design optimization, manufacturing analysis and the latest in design tools. All engineering work, modeling and drawings are designed in SolidWorks® 2015. Finite Element Analysis (FEA) is performed in SolidWorks Simulation® which is widely recognized for delivering very consistent and accurate FEA results. Unigraphics®, MatLab®, EdgeCam®, Espirit® and PC-DMIS® CADCAM software are also in use.